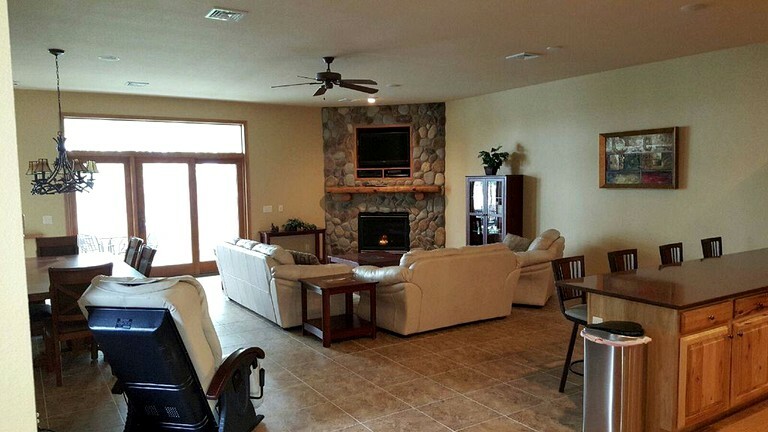 This lakefront luxury rental is located on Castle Rock Lake in Mauston, Wisconsin, and can accommodate eight guests. There are three bedrooms, two full bathrooms, and one-half bathroom. 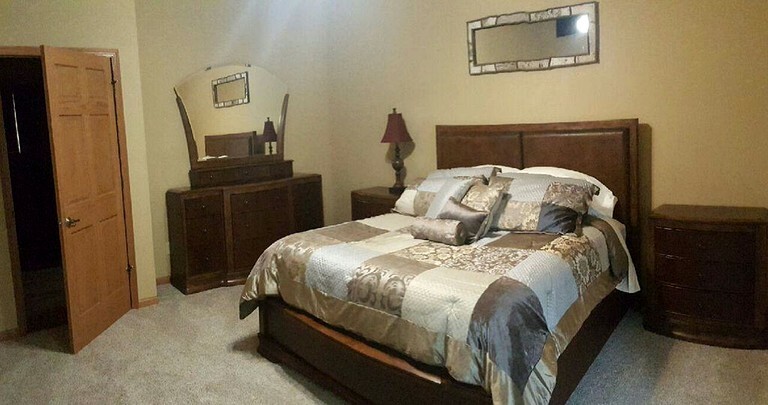 The first bedroom has a king-size bed, a walk-in closet, and a bathroom featuring a whirlpool bathtub and a separate shower. 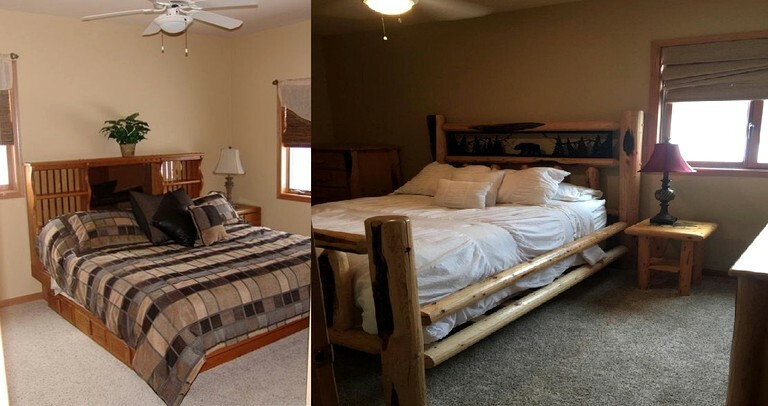 Guests will find another king-size bed in the second bedroom and a queen-size bed in the third bedroom. There is also a sleeper sofa and an inflatable queen-size mattress on which guests can sleep. Linens and towels are provided. In the living room, guests will find a television, a DVD player, a sofa, two armchairs, a massage chair, and a fireplace. 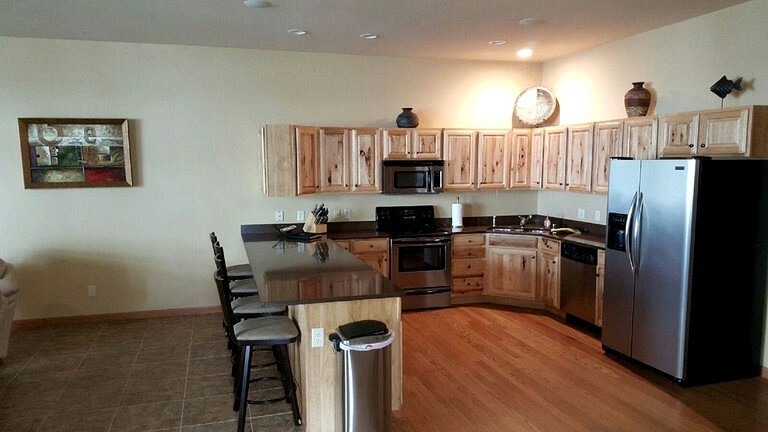 The fully equipped kitchen comes with a stove, a microwave, an oven, a toaster, a coffee maker, a refrigerator, a freezer, an ice maker, a dishwasher, and a breakfast bar. The dining area includes a dining table that seats six people. 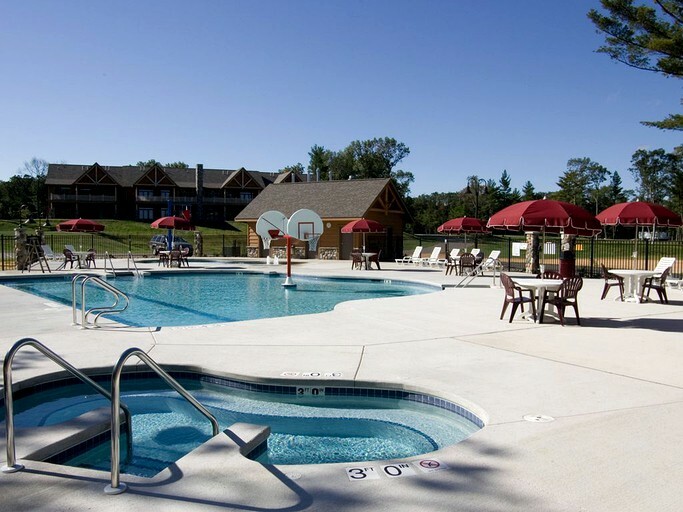 Other amenities include Wi-Fi, air conditioning, heating, a washer and dryer, a two-car garage, and two bicycles. 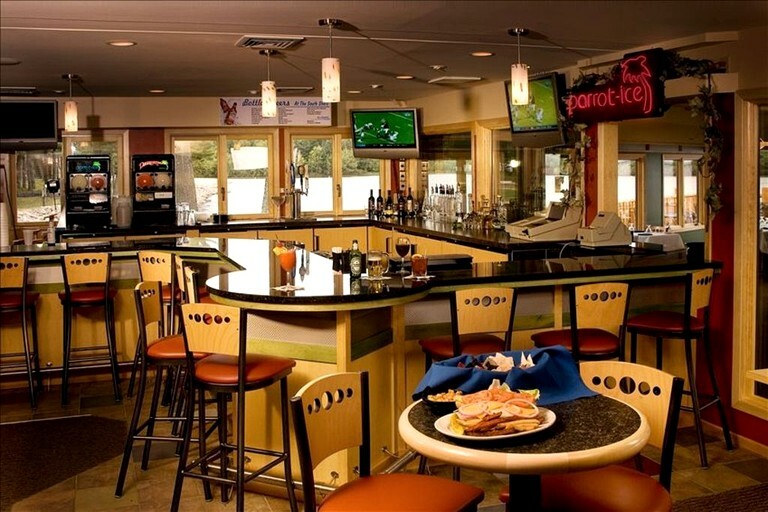 Indoors, guests will enjoy a clubhouse with a den, a fine-dining restaurant, and a bar, a billiards room, an arcade, a eucalyptus steam room, a hot tub, a cold plunge pool, two spa treatment rooms, and two massage chairs. 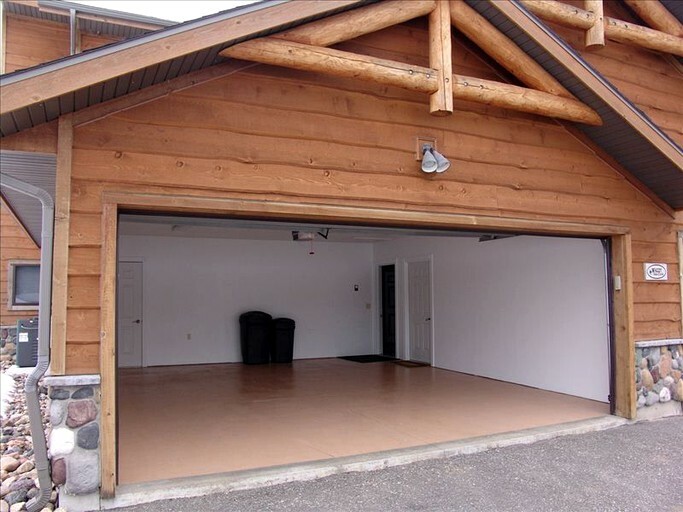 Outdoors, they will enjoy a pool, another hot tub, a gas grill, a fire pit, and a beach. A large variety of spa treatments and massage services are available, including aroma body wraps, massage therapies, Shiatsu treatments, and skin care treatments. 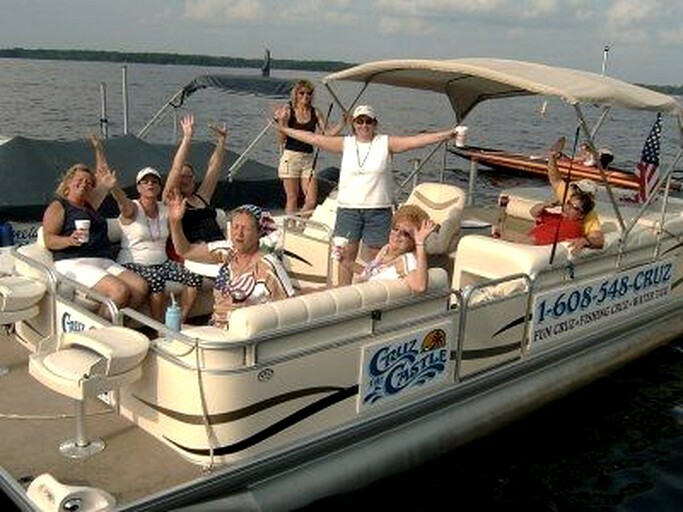 In the spring and summer, guests can go swimming, boating, jet-skiing, kayaking, and stand-up paddle boarding on Castle Rock Lake, with rentals available from Dells Watersports, Castle Rock Lake Water Sports, Smith II Marine, and Edgewater Marine. Guests can go golfing at Castle Rock Golf Course, Trappers Turn, and Christmas Mountain Village. They can also go biking on the Elroy Sparta Bike Trail and hike at Buckhorn State Park. 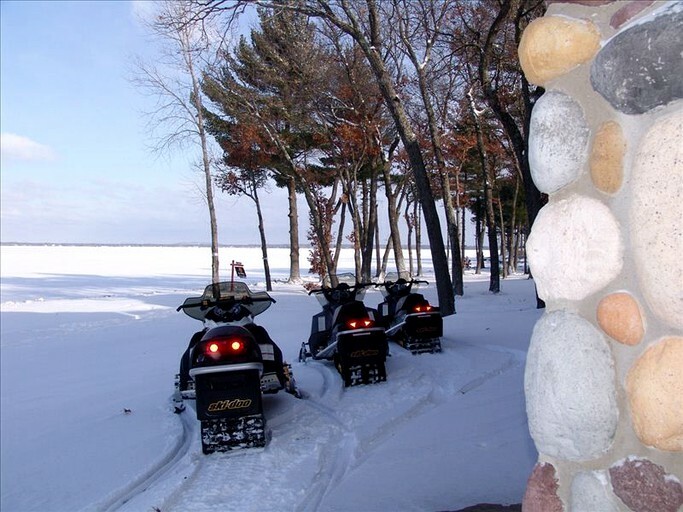 In the winter, guests can go snowmobiling right from the site, with rentals available from the site as well. They can also go skiing at the Christmas Mountain Ski Resort and Cascade Mountain Ski Resort. Smoking is not permitted. Pets can be considered.